Memorize how to make this. It is simple. It is beautiful. It is delicious. 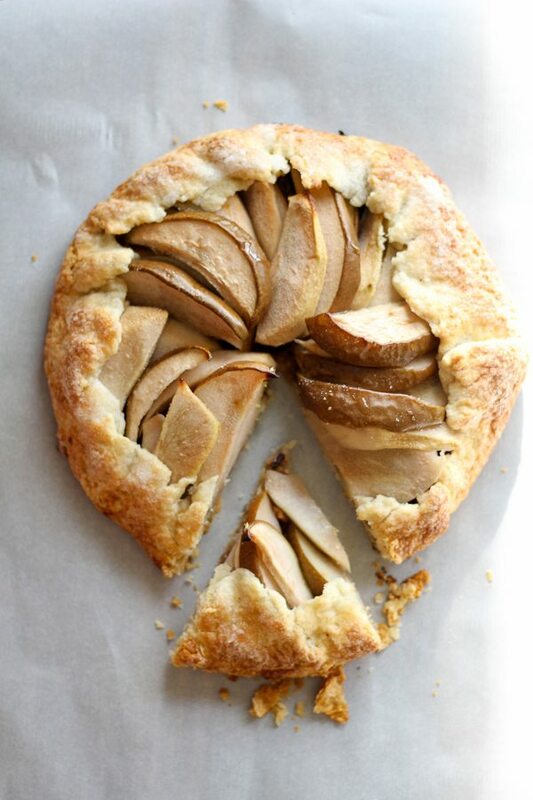 This Rustic Pear Galette recipe is my new fave. The buttery and flaky homemade galette crust is to-die-for. 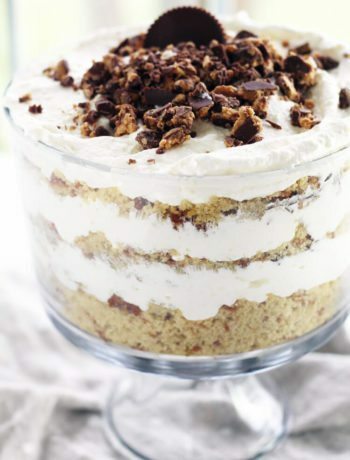 With a few basic pantry ingredients, you can create an amazing dessert your family will love. Sweet pears, chopped pecans, and brown sugar top this rustic pastry. No fussy lattice, no crimped edges…just authentic flavor. This recipe will be made again and again. Sure, I will change up the fruit inside from time to time. No special tools needed. No expensive ingredients. This crust comes together so easily. The small amount of effort you put into this galette recipe pays off in a big way. The secret is using very, very cold butter. Work the dough quickly until the butter is in small pieces. Form the dough into a round disc, wrap with plastic, and toss into the fridge for half an hour. I highly recommend parchment paper. Makes baking and clean up a breeze. Plus it ensures the galette will not stick to the pan. No fussiness here. Roll the dough out into a sorta-circle shape. 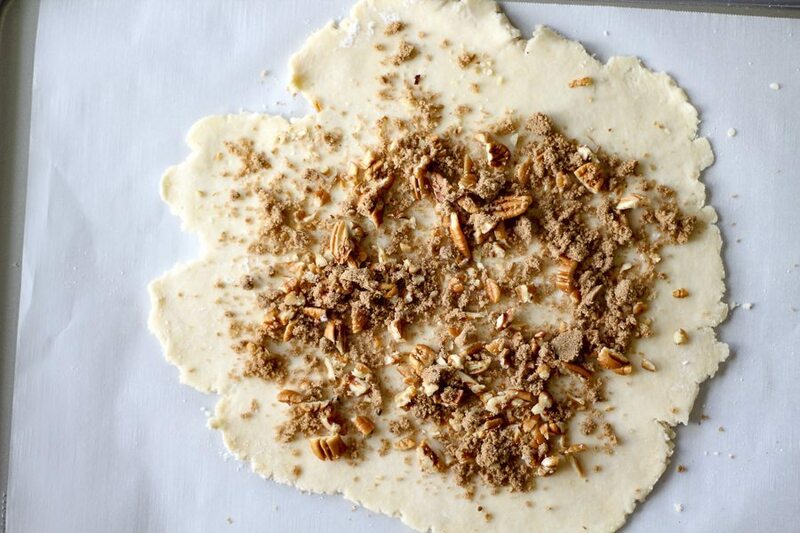 Sprinkle the prepared dough with brown sugar and chopped pecans. 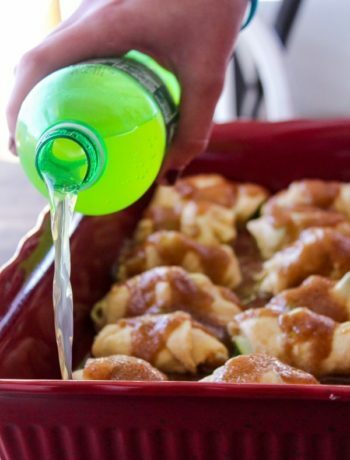 This sweet mixture collects all of the juices from the pears on top. And pecans because…well…pecans. The fruit topping is up to you. We went with sweet pears…their firm texture holds up well to baking. You can also make this rustic galette recipe with apples, strawberries, cherries, berries. (And there’s always savory galettes.) Peel the pears if you like. We left half of ours unpeeled for added texture and color. This is a rustic galette recipe, after all. Layer the fruit on top of the dough. No need to be perfect. Trust me, this is going to turn out beautifully. Be sure to leave about half an inch of dough uncovered. 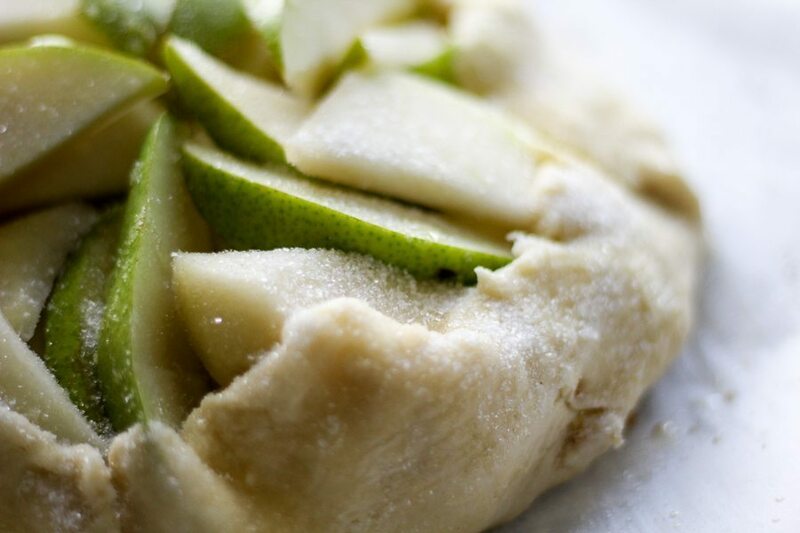 Fold the galette dough back on the pears. Pinch the dough to itself. If the dough tears, no worries. Just tear off a little piece and patch it up. Brush the dough with melted butter and sprinkle liberally with sugar. Go ahead and sprinkle a little sugar on the pears, too. Bake until beautiful. The buttery galette crust will be golden brown and flaky. Those little pockets of cold butter will melt and create that perfect pastry crust you love. Cook until the pears are tender but still firm, about 45 minutes. 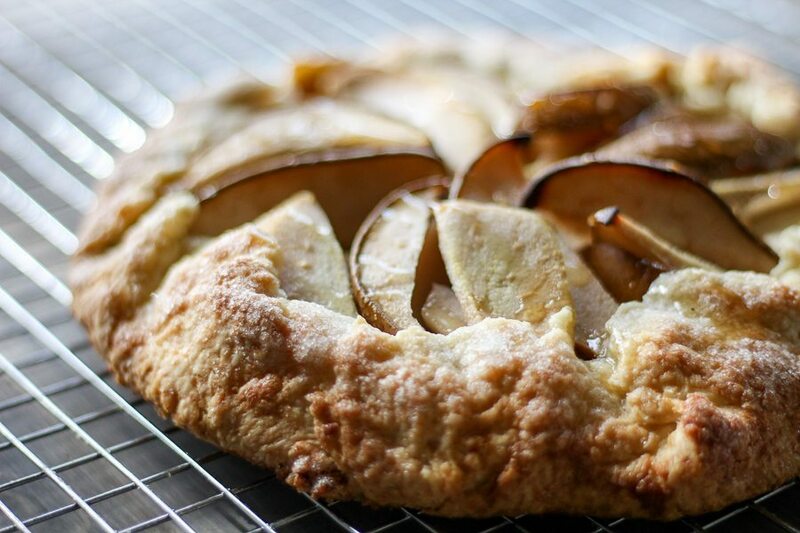 The hardest part about this Rustic Pear Galette recipe is letting it cool. Yes, you have to let it cool for 20 minutes before slicing and serving. I like mine drizzled with a little honey. Memorize how to make this. Seriously, just make some basic notes and you will forever have a go-to dessert recipe. It is simple. It is beautiful. It is delicious. 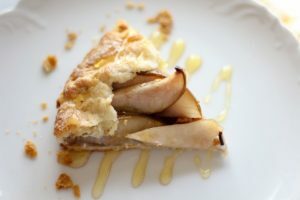 This Rustic Pear Galette recipe is my new fave. In a large bowl, stir together flour, 1 tablespoon of white sugar, and salt. Cut 7 tablespoons of butter into 1/2 inch sized cubes. 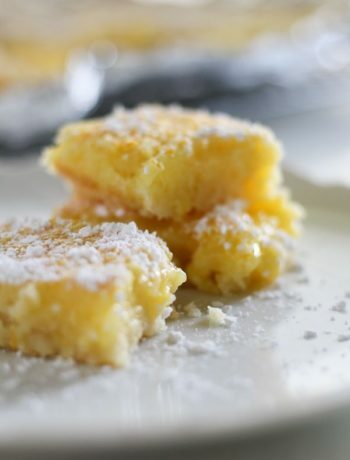 (Save 1 tablespoon for later.) Add cubes of butter to flour mixture. 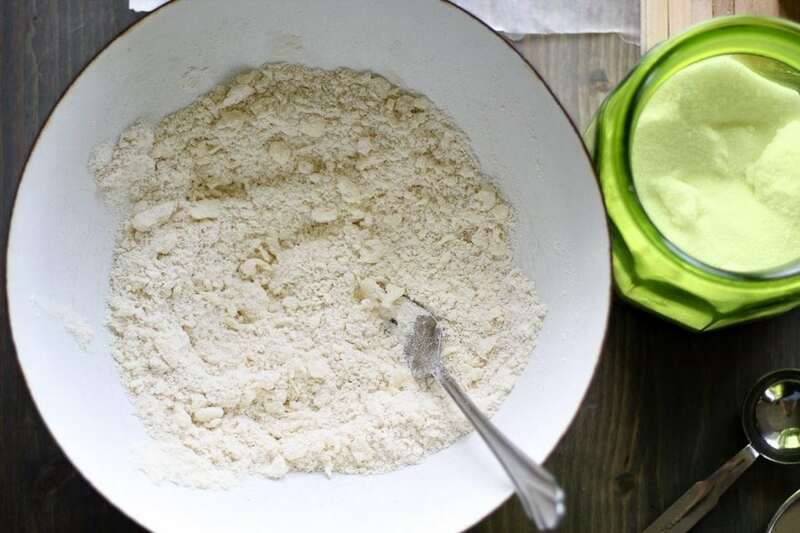 Using a fork, work the butter into the flour until it has a crumb-like texture. You want the butter pieces to be no larger than pea-sized. Work quickly so the butter stays cold. Sprinkle the cold water over the mix a little at a time. Stir with a fork to distribute. Continue to add water and stir. Press the dough into a round ball and flatten into a disc. Wrap with plastic wrap and refrigerate for 30 minutes to an hour. Wash and core the pears. Slice into thin wedges. You can peel the pears if you like or leave the peel on. Remove the dough from the refrigerator. Place on a floured surface and roll into a 12 inch circle. 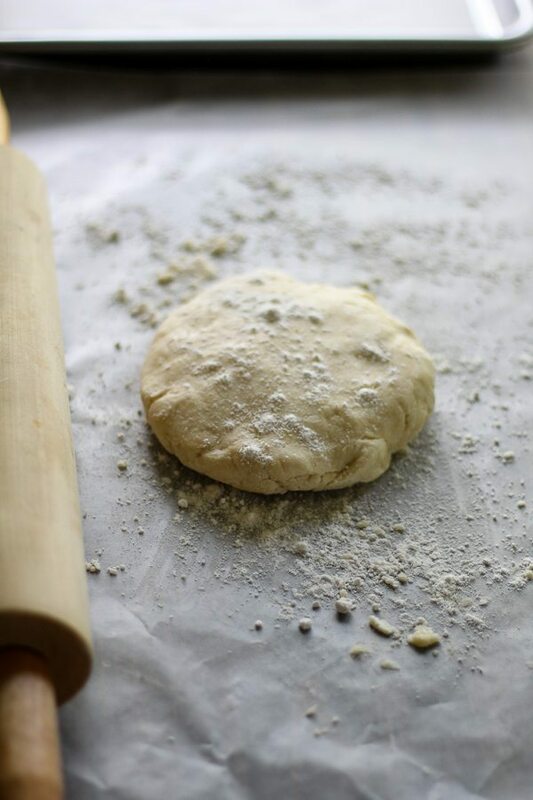 Transfer the dough circle to parchment lined baking sheet. Sprinkle dough with the chopped pecans and brown sugar, leaving 1/2 inch bare. 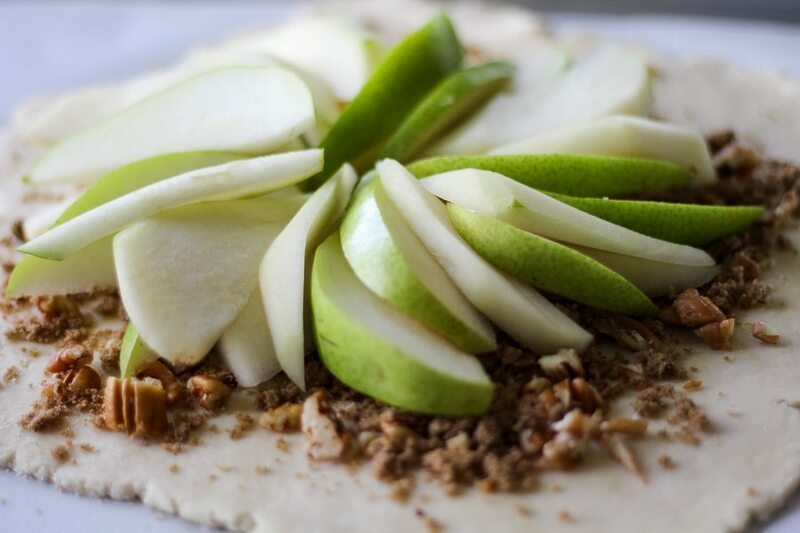 Arrange pear slices on dough. 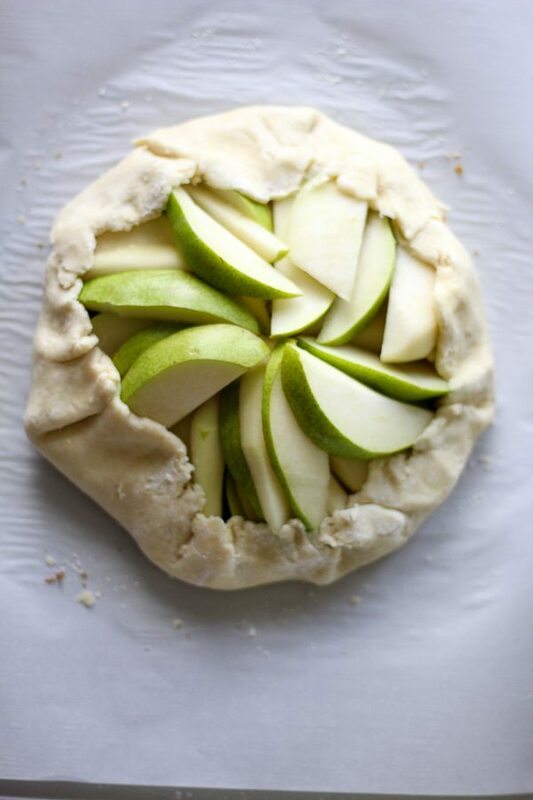 Fold edges of crust onto itself and the fruit. Melt remaining butter and brush outside of the crust. Sprinkle crust and top of the galette with the other tablespoon of sugar. Bake for 35 to 45 minutes. Rotate during baking if needed to ensure even cooking. When the crust is golden brown, remove from the oven. Transfer the galette to a cooling rack. 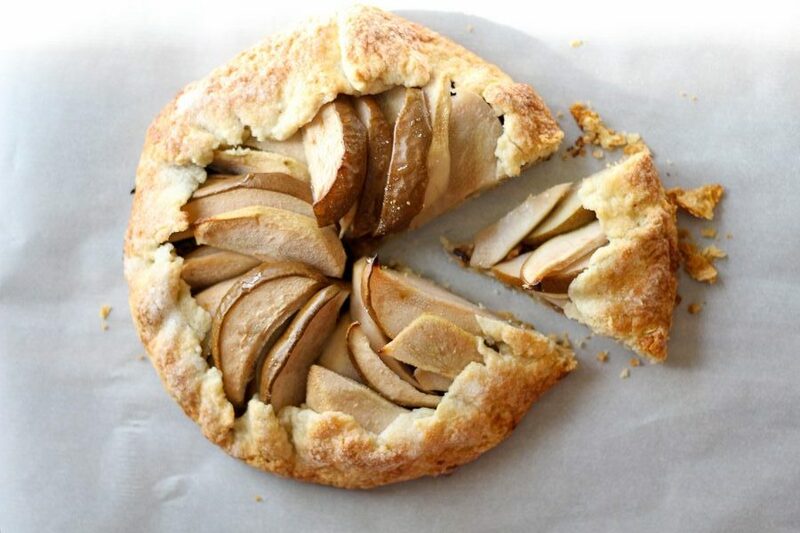 Allow the galette to cool for 20 minutes before slicing and serving. Drizzle with honey before serving. Thanks for this wonderful recipe. Tried it & this tastes awesome! Thank you for sharing! I can’t wait to make it again with other fruits. The crust is my favorite part, though.